There is something about The Mahabharat (aka The Mahabharata) which makes people re-read and re-tell it so many times, from so many different perspectives without getting bored. The entire story is known to almost everyone, especially who grew up in India or in Indian environment or has knowledge about India, Indian mythology and Indian literature. Since the time when Krishna Dwaipayana Vyas (who is better known as Ved Vyas for the mammoth work he did in classifying the Vedas and structuring them in the way they are today) it is re-told and re-written by many authors. Everyone of the writers tried exploring the legend from their own perspective. An author grew up knowing Indian mythology and ancient tales, dreams about telling the Mahabharata from his own perspective some day, and that is the real power of the tale. And, almost everyone who tries to pen it down, never forgets to pay his/her respect to the original author of the story Ved Vyas, and the writer, Lord Ganesha. Here are some of the books we came across, which explores the story of Mahabharata (or Jaya Samhita, which is the original book, with broader canvas). 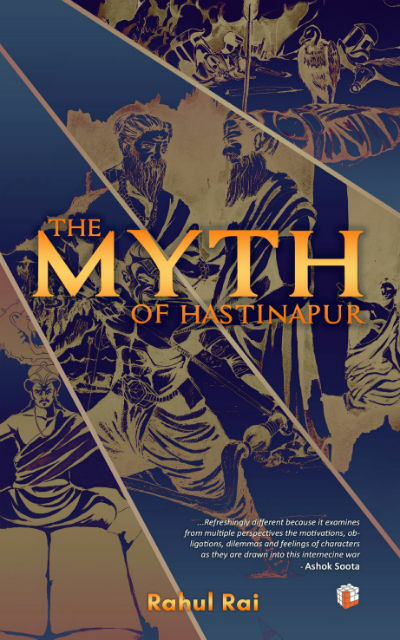 Recently we came to know about a book named The Myth of Hastinapur written by debutante author Rahul Rai. Rahul is another engineer who studied in IIT and joined the growing list of “engineer by education/profession and writer by passion”. I, from our team, was given a chance to read the book and I liked it and here are my unbiased views and reviews for the same. Let us take a look at the book cover, as it is going to make the first impression of the book. The book cover, as you see, contains illustrations containing characters and representing incident from the Mahabharata. The cover page is moderately good. While it tries to justify the title, it gives you an impact of viewing negatives of the photograph via line art. Some readers may not find it very attractive. In almost all of our book review articles you can find a section exploring “the plot” of the book (minus spoilers, of course, as much as possible). But, I don’t think, I need to reiterate the plot of Mahabharata, right? As it is said in the beginning, the story is known to almost everyone, especially, the readers who are interested in exploring a book associated with – the Mahabharata. So, let us take a different perspective this time. Let us talk about various segments of the book and my views and reviews for the same together. First and foremost, this book has a different way of storytelling. Mahabharata (which I like to call Mahabharat, as it is pronounced) is like a tree. While there is a root, which grows into various characters, incidents and stories based on various incidents in their way of life, making it to grow like different branches, having their own attributes, blossoming with the fruits of their Karma and leafs of their characteristics. The author tries to explore the tales in the similar way. He first takes a fruit, introduces it and than talks about its growing up, starting from the root, passing through the trunk, exploring the branch of event which ultimately results into the present state of the fruit. I like this way of storytelling. Well, I personally think that there could have been more tracks, but, well, it is about the Mahabharata, no matter how much you write about, you will fall a little short, always. I am not going to spill the beans about which tracks are there and what is written there in order to keep your reading experience intact, let me show some of the attributes of the books via its writing. The entire forest was standing resolutely in silence against the unbearable heat. It was too dark to see anything as the moon was hiding behind the vutures that were coming in droves to feat upon today’s kill. A weak person tries to hide behind Dharma and such virtues, Rajan. A strong man embraces his motives. A blind queen will remain blind to her son’s follies. The Pandavas lost their throne at the game of dice as well. If it was so dear to them, why did they put it as a wager in the first place? … the one who has nothing but family is wealthier than the one who has everything but none to call his family. As you dedicate your successes to me, your worries belong to me too. Selfless deeds have a charm of their own… A selfless deed remains such till others cannot see the real motive behind it.It lends a certain appeal to the witnessing audience who feels the deeds were committed for a higher purpose not decipherable through their limited understand. They are attracted by its magic and want to remain enchanted by it. When one wrong decision meant slaying of your whole clan, the thin line between truth and wartime strategy vanishes… Whatever I might have done, life would have been lost, and it is always better to take the life of your opponent rather than lose one of yours. What kind of teacher wants his student of forget the most important lesson he had taught, at a time he needs it the most? No, I am betraying the side which betrayed me. The way the war affects everyone including those who are not directly associated with it and what citizens and soldiers could have thought about the great war of Mahabharata is explained in effective manner. While it is disturbing, you can see the sense in the thoughts. It is a family feud. It was always this and will always be this; two men with big egos fighting for a toy at stake, the throne of Hastinapur. Neither of them knows what to do with it once they get it. Nor any of them can claim to be a good ruler. How can a person who throws his subjects into a war claim to be their savior? War is a game of vanity, son. It is the greatest sin one can commit. How can pride and honor of one man be greater than the lives of others? While they were quick in training the plough wielding farmers in the art of warfare, they would come on horsebacks to the villages once this battle is over to extract taxes from the same farmers who fought for their selfish cause. Two of the dearest friends of all times died in the same day passing their hostility to their children. None of the characters in this book are plain black or white, all of them have their own shades of grey. And, that is what a human being is. Everyone has his/her own strength and weaknesses and no one is complete. The author takes a look at all the characters, including that of Krishna from that perspective. He tried to remove divine intervention kind of things from the key events of the Mahabharata, and tried to present it in logical aspects. While there is a lot talked about Karna, Draupadi and others’ there are characters like Yudhisthira, Ashwatthama, Barbarik, Ghatotkach and others, which remain unsung. The author tries to talk about them as well. The way, the author has envisioned the story he wanted to tell, can be summarized in this line from the book. I believe it for a fact that the intent of history is not to impartially observe the past but to justify it for the future. Be happy with what you have and you will be happy throughout your life. Trying to gain possessions makes you more materialistic and ties you down. When talking about the last days of Krishna, the author refers him to be in Mathura, actually, Krishna, once left Mathura and settled in Dwarika, remained there. The deadly battle amongst the Yadavas happened with the grass grew on the banks of the sea, and the place where Krishna breath the last, is a famous site named Bhalka, in Saurashtra region of Gujarat state, on the west coast of India. While it is tough for debutante authors to find a publisher and getting a physical book printed, the author’s decision of getting it published on Amazon Kindle only, is a good economic decisions. However, it makes its reach limited. Vikas Chettri’s illustrations which digitized by Abhilash Chaurasia are good. As Devdutt Pattanaik tried in Jaya, the author could try having more illustrations in the book. Possibly, it could make the book more alive. The book is a gem to read, especially for the mythology lovers. If you can read with open mind and without any prejudices, you should go for it. Remember, it is not a light read and it contains some hard stuff. It has some literary attributes worth going for, and, I see a worthy competitor in Rahul to the well-established authors writing in this (mythology retelling) arena.